Many thousands of years ago in India someone figured out there are energy centers in and around our physical body that help us to understand emotions and how to process the energy that is all around us. These energy centers help us to give and receive different kinds of emotions and energies. Chakra 1: Root Chakra: Grounding and feeling safe: Located at the perineum. Chakra 2: Sacral Chakra: Relationships, creativity, sexuality: Located around and just below the navel. Chakra 4: Heart Center, how you love and are able to receive love: Located in the center of the chest. Chakra 5: Throat Center: How you communicate with yourself and others, also how you are able to understand what others are trying to communicate to you. Located in the center of the throat. Chakra 6: Third eye: Gaining insight about yourself and others in a deeper way. Located in the center of the forehead. Chakra 7: Crown Chakra: Your connection with God, The Universe, The Divine, whatever that higher power shows up as for you. Located at the top of your head. Each chakra has a front and rear aspect. The front comes out of the front of the body and the rear is connected and opens in the back. The front aspects are about how we give the rear are about how we receive. Someone can be able to give a lot of love if their front heart chakra is wide open, but often times there is an imbalance with the rear chakra being closed and so it creates someone who give a lot of love but is not able to receive love at all. 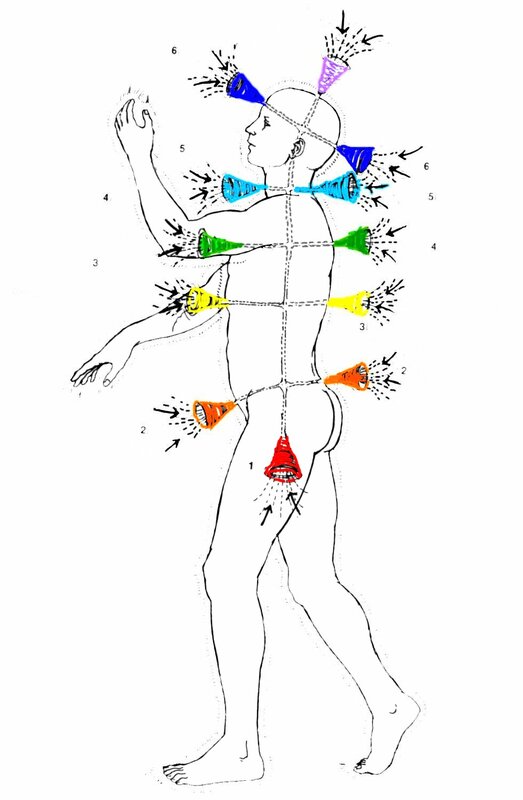 All chakras are connected front and back and also from the top of the head through the root with a channel of light that runs through the center of the body. There are also 2 other channels that run on either side of the spinal column. There are many more chakras and connections, but a basic understanding of these 7 will probably be more than enough information if you are just starting out. All chakras work independently, but they also work together. It’s kind of like your hands work on their own, but in order for them to work properly you need your arms and shoulders to be working as well. If your shoulders are out of alignment your hands are going to have a more challenging time doing what they need to do. The same goes for chakras. When your chakras are open, flowing and in communication with one another you are able to interact with the world in an easy and effortless way. You feel like you are at one with everything and everyone and life is a beautiful place to be. When one of our chakras is out of alignment it causes a breakdown in understanding and communication with the other chakras. An example of this would be: Let’s say you were feeling really amazing one day and you wanted to share something you saw with a good friend. That friend might not have been in a good mood that day and told you they didn’t want to hear about it. If your throat chakra is open and flowing with the rest of your chakras you might just brush it off, but there might be an old memory hidden from childhood that says, ‘Nobody wants to hear what I have to say, what I have to say isn’t important.’ Your throat chakra might close down thinking it is protecting itself. When your throat chakra closes down you are not able to communicate in an open and flowing manner. Even if you feel a deep experience of love in your heart, you won’t be able to express it. It’s often the reason that we feel so much love welling up inside of us but we don’t know what to do with it. There is a disconnect. What do we do when we identify that perhaps there might be a disconnect or trigger in the chakra? Get yourself into a quiet place. Calm your body and breathe deeply. Scan each of your chakras for feelings of resistance. If you come across some resistance, breathe into it. Allow yourself to relax as much as possible. You might feel deep intense emotions and that is ok, just breathe with them. You have already been through the hardest part of the pain, what you are experiencing is the emotions coming through your body to be released. Imagine that the emotions you are feeling are coming from a small child who is afraid and is in need of some comforting. The more relaxed you can be during the release, the easier and faster they will dissipate. Keep present with these feelings and dive deeper into them, seeking out every last little bit of them and as you do they will quickly dissolve like dew in the sun. Or you can schedule a SpiritBody Integration where we go more in depth into all of the chakras front and rear as well as their aspects and release any energy or cords that are keeping you from full clear flow and alignment. Wishing you Clarity, Alignment, Strength and Balance on your journey through life!